Look at those trees bending, buffeted by wind as the rain comes pouring down on Forza Horizon 2's new Storm Island expansion. It could be worse. The weather is often bad on Storm Island, hence the name, but the extreme weather touted in the expansion's press materials isn't really all that extreme, especially when compared to the other first-party new-generation driving game, the PlayStation 4's Driveclub, and its much-lauded dynamic weather system. 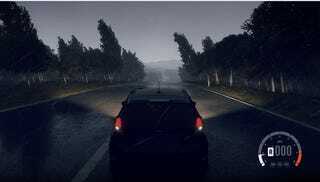 In Sony's driving game, extreme weather means your vision is going to be heavily handicapped. Rain (or snow) falls aggressively, speeding towards your windscreen, headlights shining on the droplets making things all the more disorienting. In Microsoft's game, weather looks violent, but it really isn't. Trees are bending and, from the outside at least, it's raining cats and dogs. Switch to the cockpit view and it's all a relatively light drizzle. The effects are quite nice. I love the cars kicking up water from their wheels. When the fog rolls in it adds a nice bit of tension — not too much, just a smidgen. The roads do look perilous, but we're driving trucks made for these conditions and rally cars specially outfitted for them. It's a drive in the park. Mind you, I'm not saying the Storm Island expansion falls flat because the weather effects aren't extreme enough. They're just not the star of the show here, despite the weather-related expansion pack name. Storm Island isn't about storms. It's about insane off-road racing. It's about tracks with more bumps and dips in them than anything that Forza's done before. It's about the exhilaration of catching massive air versus the frustration of flying off the track. It's about racing trucks through the mud in the middle of the night. Compared to Driveclub's wild and crazy dynamic weather system, Forza Horizon 2's Storm Island is light spring showers. Forza Horizon 2 still comes out on tops in terms of number of vehicles, open-world racing, off-roading, sheer fun factor and not being broken for a month following release. With all of that going for it, I can handle some light rain.